← The Sheraton Plaza in Jerusalem (known as the Plasha) is no more…. Hagafen has continued to expand its own vineyards, while perfecting their relationship and processes with its many vineyard partners. They have long term contracts with the vineyards, and have recently taken control of many of the coveted blocks within the upper echelon of Napa Valley vineyards. Stein repeated often that Hagafen is not just about wine, but about making the wine that the grape is willing to give you. Recently, there has been a push to make the grapes/vineyard bend to the needs or wants of the wine world. For example, America’s love affair with overripe and fruity wines has pushed many a winery to bend the grape to their will. Instead, according to Stein, the mantra at Hagafen is to create wines that show the fruit as they are, and as such, there is variation in the vintages of the same varietal, year by year. The vines leaves are hand pruned in a two step process, and are dappled, to keep the sunshine at bay, and not create fruit bomb wines. When we arrived at the end of the year, the vines in front of the winery were already pruned quite nicely. 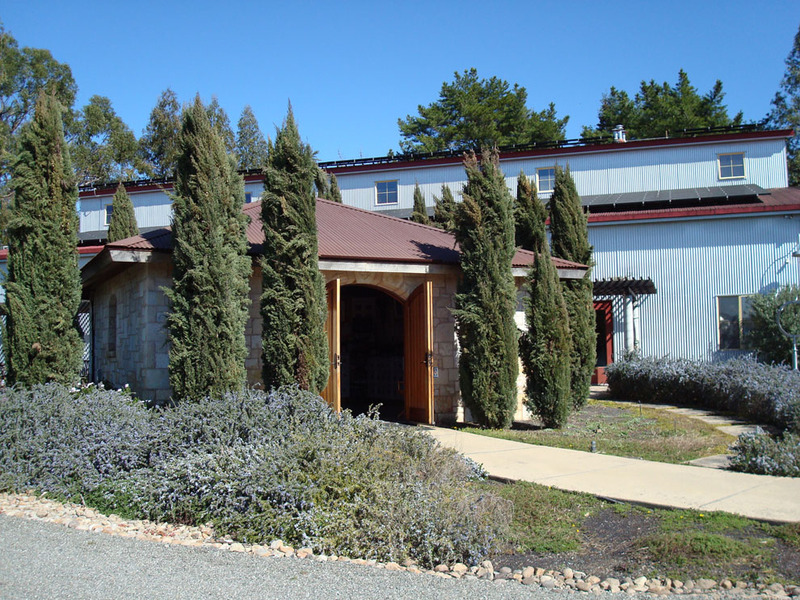 The vines, as stated before, were replanted in 1997, the winery building, which is pictured above, was built in 2000, and the lovely tasting room was completed in 2002, to imitate a Mediterranean/Tuscan styled tasting room. As we spoke about the vineyard, the winery, and its history, one could only be in awe of the persistence in living one’s dream and persevering though all of life’s obstacles. When Weir bought the vineyard, Stein says that they were not sure that they could actually make it. They put everything they had saved up, into the vineyard, but it was the correct thing to do. Sure, you can hope that the vineyard managers see eye to eye with one’s vineyard canopy or maintenance beliefs, but as time has shown, there is no assurance, unless you control the land and the vines themselves. So, it was a logical yet terrifying step to take for a man and a winery so passionate about the vine and the wine in equal proportion. Looking around the vineyard, one sees the requisite fans (much like the one pictured here), to keep the air flowing consistently throughout the vineyard. Frost, hot pockets or cold pockets can doom a vineyard. The science of vineyard management has truly improved in ways beyond one’s imagination. However, the basic rules of air movement, drip lines, and frost aversion have stayed much the same for last decade or so. The massive fans can help warm up the vineyard when needed, or cool them down at night. They run automatically, via temperature controls, and can be manually turned off and on as well. What people tend to forget about these vineyards and these fans, are that people live in Napa Valley! Actually there were for sale signs on homes less than a few hundred feet from Hagafen Winery. It is one thing when sprinklers or drip lines go on at 3 AM, to help warm the vines up a few degrees, thereby preventing them from freezing. However, when one of those massive fans goes on, it sounds like a B 52 bomber is in your backyard! I can only imagine what the first timer’s think, when one of those fans go off! Rumor has it that there was a newcomer to Napa, who heard the fans go on in the night, got up in the dark, and thought that Napa Valley was being attacked by lots of low flying planes! While it does sound like a B-52 is in the back yard, I hope that they do not actually leave the ground! Once more, looking around, it hit me with a vengeance; this is a winery that was tiny in 1979. It saw an opportunity in the then nascent kosher wine market. At that time they were the ONLY kosher wine producer in all of the USA, other than Manischewitz. Of course, there were other wineries in France and around the world (Yarden and Tishbi were not yet in existence) producing kosher wine, but not many that were obviously visible to the common wine consumer. Further, it was not even clear that there was a market for a kosher winery that produced high end noble wines. Gan Eden winery would start in the 80s, along with Herzog, Yarden, and Tishbi. I believe in many ways the fact that they were out there first, was a huge win for them. Their market was not set on the kosher wine market, but rather on the high end wine consumer, be he a kosher wine consumer, or not! This is the going theme when you talk with Stein, when he quite correctly and proudly tells me that that their wines have been served at the White House (starting in the Reagan administration) some 40 or more times. They took their fledgling business to the next level, when they bought vineyards and created relationships with many of the best and coveted vineyards in Napa, thereby locking them up, and assuring them of a consistent grape quality. 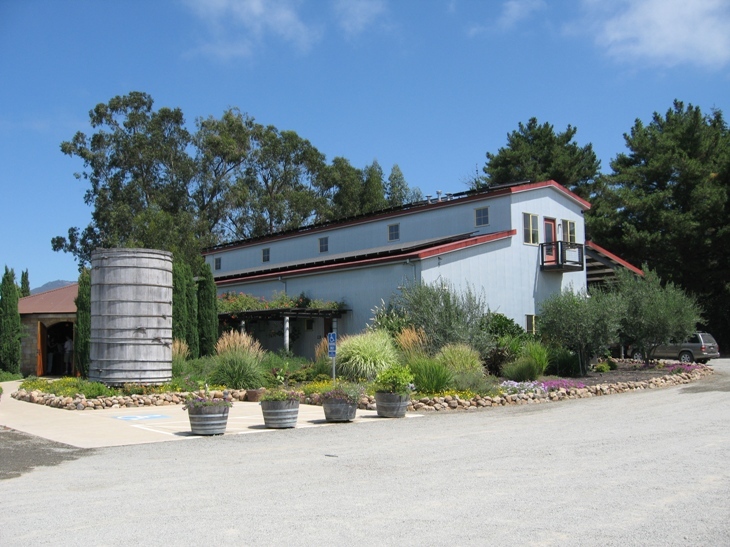 Finally, they added the winery property, the tasting room, and now a first and third wine line, to help round out their portfolio, and make sure that no wine consumer is left behind. This of course means an added risk, as they need to continue to find consumers, but they temper this new found opportunity, with smaller batches, and more marketing. This is still a family run business, even after 30 years in the business. 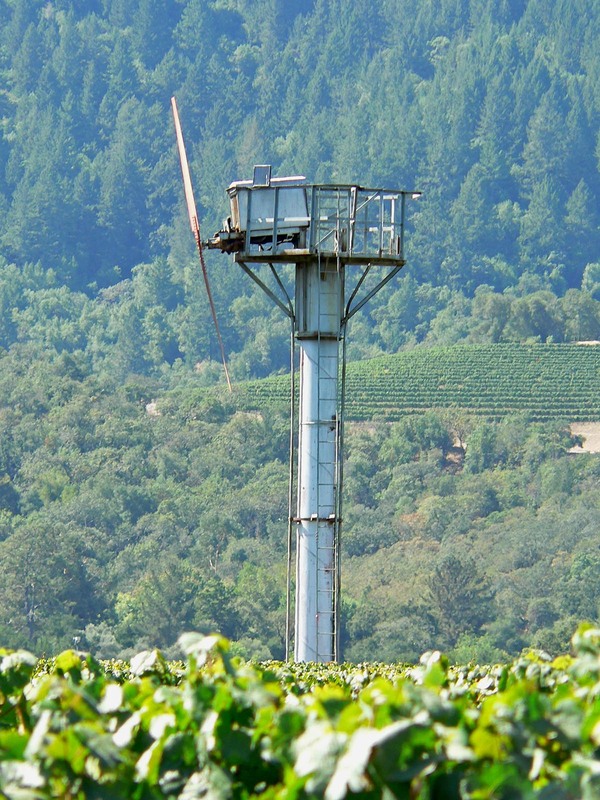 Many a successful Napa Valley wineries, in recent time, has been snatched up by big brother. Stein stressed that the winery has kept to its roots, even in the face of growing costs for land, grapes and skilled laborers, because of the free money styling of large corporations. In a way, the recession has helped Napa valley to return to its roots, and forgo the lavish and over the top life styles and impact. All told, quite a story for a winery that started the kosher wine theme, and continues to show its prowess and market leading skill and capability. We then moved on to the winery, but I had to ask about the question, how can Hagafen boil their wine, and still make such a great product? What – they boil their wine? Why would anyone boil wine? Well, the kosher wine market boils their wine to make it mevushal. By making the wine mevushal, they can see their wins to Jews to be used at all occasions, where Jews and Non-Jews may be found. Hagafen has been kosher since its introduction in 1979, and continues to be so still today. Hagafen started, and was for many years, under the supervision of the KORC, Rabbi Traub out of San Francisco, and was not boiling his wine. In the later 80s, under pressure from Herzog, Weinstock, and Gan Eden, they moved to the Triangle K supervision, which was not a high grade supervision, even at that time, but was a nationally recognized supervision, and they too did not require them to boil their wine. However, as the kosher wine market started to take off in the 90s, and with Hagafen on the outside looking into the Orthodox kosher wine consumer (that did not accept the Triangle K); they switched to the OU kosher supervision. OU required that they boil their wine, as they were still at the crush facility. Once they moved into their new home in 2000, they continued to mevushal their wines (even though they did not require to), as the wines could then be bought by Jews for ceremonies that included non-Jews in it. Stein was more than open and explained that they do of course boil their wine, but they do so very quickly and very EARLY in the process. Hagafen and Herzog are the two big boys in the mevushal business. Their wines are some of the few that can handle the early boil, and yet continue to age and improve in the bottle. Of course, the true humor is that, mevushal is a loophole created by the Rabbis during the temple times, to limit Jews from interacting with non-Jews, because the quality was so bad, and no self respecting person would drink boiled wine! Now that technology and processes have improved mevushal wine quality, and made them almost equal to their non-boiled brethren, I wonder if those Rabbis would still allow the mevushal loophole. Tangent aside, many wineries in France boil their grape must to remove the green notes from their wines that are so prevalent in the sun depraved Bordeaux and Burgundy regions. Stein showed us the “mevushaler” that is capable of taking the wine from its barrel temperature to a boiling point, and then back to the barrel temperature, in less than 2 seconds. That was one really cool piece of hardware, and clearly not what they had 20 years ago, let alone 3 thousand years ago, when mevushal was enacted. After, showing us that, I asked where the bottling machine was. The answer was the same one that many wineries use; they use a mobile bottling unit. The mobile bottling unit is a great idea, it lowers the winery’s upfront cost, and it can be done in a quick and complete manner, quite a nice piece of technology. Of course, the mobile bottler needs to be cleaned and “kashered” (made kosher), by pushing boiling water through the whole system, which Stein says they do not care. As long as you do not break their unit, they could care less. As we walked through the barrel room and took in the smells of fresh ripe fruit and oak, we started to discuss the business of wine, the Hagafen wine portfolio, and their wine clubs. 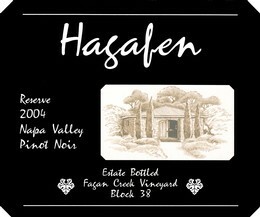 In 1979 Hagafen started their winery with a single label. They added wines to the main line portfolio, but stayed true to their line and added grew the SKU, by adding grapes, vineyards, and varietals. Cabernet Sauvignon and Riesling may have been how Hagafen started, but they quickly added many more noble varietals, such as Pinot Noir, Zinfandel, Sauvignon Blanc, Cabernet Franc, Syrah, Merlot, and Chardonnay. In 2004, Hagafen had the chance to lock down some wonderful vineyards, and to acquire the grapes that would allow them to add a reserve level wine to their portfolio, that goes by the name Prix. The black label has an image of the new wine tasting enter on it, along with the vineyard from where the grapes are sourced. The Prix line started with the label seen here, and has grown to as many as 8 or more varietal. In 2006 they added yet another label, this one being the lower level line of the portfolio, Don Ernesto. There are three wines in the Don Ernesto line. A Vin Gris Rosé, a white wine mélange called Collage, and a red wine mélange called Ernesto. The line is not advertised as being kosher (though it is of course), is only available at the winery, and its two mélange’s makeup are a closely kept secret, that I could not pry from Josh, no matter how hard or persuasively I tried. But more than anything the final line in the portfolio is more about being fun and effervescent with the wines, both from the colorful labels and website, to the styling of the wines. Please do not take that as a slight or even think that these wines are not ready to handle your food, on the contrary, these are wines that are “entry level”, but far surpass the common level wines of most wineries today. Hagafen may well have had the earliest kosher wine club in the entire world, but for sure in America at least. They started their wine club in 1981, once again showing true entrepreneurship in the kosher wine business. When they added the Prix line, they added a new wine club that would best showcase the reserve wines as well. With the three lines securely cemented, a growing number of varietals, unique desert wines, a history that many a Napa Valley winery would be envious of, and a winemaker in Weir that is passionate about not only the wine, but the presentation as well. With where Hagafen is today, along with its kosher supervision and their world class mevushal process, Hagafen is poised to continue to create world class kosher and mevushal wines that are enjoyed the world around by kosher and non-kosher minded people alike. When asked why Mr. Weir decided to make his winery kosher in 1979? Stein replied, that Ernie got into wine because he likes to grow things–that’s what’s always been a primary interest of his; he went for wine because he grew up in a household where wine was regularly served, not seen as something saved only for special occasions. He went with kosher because at the time, Napa was making a name for itself (this was post -1976, after all), but no one was making wine with a kosher aspect to it. Ernie felt then and still feels today that the religious aspects of wine, its relationship to the core of Judaism make it an important product to be involved with. The nose on this light gold colored wine is popping with honeysuckle, papaya, grapefruit, and pineapple. The mouth on this medium bodied wine has fresh papaya, pineapple, and honeysuckle. The mid palate has bright acidity, oak, and cut grass. The finish is long and layered with bright fruit, oak, and cut grass. The nose on this intense rose colored wine, is bright with raspberry, cherry, delightful fresh strawberry aromas, and a bit of floral notes to boot. The mouth on this light to medium bodied wine is refreshing with rich cherry, strawberry, and raspberry. The mid palate is acidic, with a touch of spice. The finish is long and lovely with concentrated red fruit and a touch of tart cherries. The nose on this straw colored wine has honeysuckle, grapefruit, rich papaya, peach, and apricot. The mouth on this medium to full bodied wine has rich peach, apricot, and grapefruit. The mid palate is balanced with acidity and fruit. The finish is long with peach and a touch of oak. The wine is rich and bright, and a great wine for a hot summer day. The nose on this dark garnet colored wine is hopping with rich raspberry, a hint of blackberry, kirsch cherry, and oak. The mouth on this medium to full bodied wine is concentrated with soft tannins, rich cherry and raspberry. The mid palate is balanced with acid and integrated tannins. The finish is long with more cherry, chocolate and a hint of leather. This is quite a nice bottle of wine for any wine line, let alone the lowest one. This wine easily stands above other starting line wins of other wineries. The nose on this dark ruby colored wine is hopping with cherry, raspberry, kirsch, violet, oak, and smoke. The mouth on this medium bodied wine is filled with raspberry, strawberry, and soft tannins. The mid palate is acidic with oak and light tannins. The finish is long with integrated tannins, acid, spice, pepper, and oak. A nice Pinot Noir that will pair well with lamb and roasted fowl. 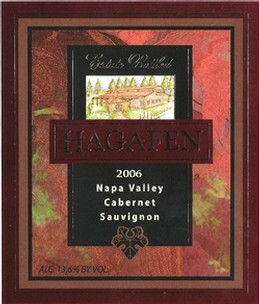 This is Hagafen’s second release of a single varietal Cabernet Franc, the other one being the 1996 vintage. We really loved the 1996 vintage, but this one was even better, though it has been around 10 years since we last tasted it. The nose on this dark garnet to black colored wine showed a bit of floral notes, along with a bunch of rich and ripe raspberry, black cherry, plum, and spicy oak. The mouth on this full bodied wine is filled with plum, raspberry, and black cherry in a concentrated package that keeps coming at you. The mid palate is packed with balancing acidity, tobacco, spicy oak, and nice tannins. The finish is long with chocolate, fig, vanilla, rich ripe fruit, spicy oak, and pepper. Quite a lovely Cabernet Franc that will age well for at least a few more years. This is one of those classical WOW wines, a wine that keeps coming at you from the time that you smell it, through the time that you fully consume it, quite a monster and a joy. The nose on this black colored wine is packed with rich and ripe black fruit, blackberry, plum, cranberry, smoke, bacon, and rich chocolate, an aromatic vapor filled bottle of joy. The mouth on this massive full bodied wine is crammed with layers upon layers of concentrated and rich blackberry, cassis, along with big tannins. The mid palate flows off the mouth and carries the rich and concentrated black fruit, along with an acidic backbone, chocolate, more tannins, and leather. The finish is long with rich fruit, chocolate, leather, and a shake or two of pepper and spice. 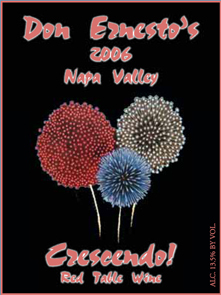 Posted on February 15, 2010, in Kosher Red Wine, Kosher Rose Wine, Kosher White Wine, Wine, Wine Tasting, Winery Visit and tagged Cabernet Franc, Crescendo!, Don Ernesto, Hagafen Winery, Napa Valley, Pinot Noir, Prix Mélange, Prix Reserve, Rose, Sauvignon Blanc, Vin Gris. Bookmark the permalink. 27 Comments.